Announcement Artistically designed, skillfully crafted steampunk jewelry. Like us on face book https://www.facebook.com/victorianmagpie to see new items, coupons and sales event. Vintage time pieces and jewelry re-imagined into wearable works of art, each item is a one of a kind "timeless" treasure to call your own. 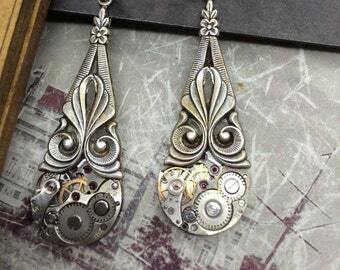 Artistically designed, skillfully crafted steampunk jewelry. My second acquisition from this shop and it’s just as wonderful as the first. Great craftsmanship, shipping is prompt. Highly recommend the shop. This is an amazing piece of work. Love everything about it, I ordered another piece as soon as it arrived. Clearly I’m going to continue doing business with this shop and I highly recommend you do as well. The items are great quality and very well crafted. Working on new listings! Hope you enjoy all the new items Lois and June have been busy making! Lots of new earring ! Saving "time" by recycling the past. I worked in gold buying and was saddened by all the vintage pieces that were being destroyed. It was like watching pieces of art and history being lost forever. Lois and I started designing steampunk jewelry because of our love for vintage items and watches. It was a natural course for two people who are passionate about antiques, jewelry, art and watches. Being able to "save" vintage items that no longer function as they were intended and recreate a new purpose for them is a wonderful feeling. Making jewelry from vintage discarded items allows me the opportunity to take my experience in the traditional jewelry, my love for antiques, jewelry and watches and fuse it with inspiration to create these items from non-functional treasure. My pieces for The Victorian Magpie’s Steampunk jewelry line are inspired by my fascination with the Victorian Goth scene and Steampunk, even while remaining a conservative, traditional jeweler. Welcome to The Victorian Magpie. Our goal it to repurpose beautiful non- functional items from the past into treasures for the future. 7 days -Money back -Buyer pays shipping both ways. We want you to be delighted with your purchase. If you have any problem with your order, including shipping issues , please contact us right away before leaving neutral or negative feedback. We have a 100% satisfaction guaranteed policy and we will do everything we can to help you. We accept Visa, Mastercard and American express through direct checkout on Etsy, Etsy gift cards, and Paypal. You don't have to have a Paypal account to pay for your items through Paypal. Please allow at least 2 days after payment is received for your item to be made before it is shipped out to you. Shipping does not include import duties. Shipping for each item added after the first item is free- up to 4 pounds. Delivery confirmation is included on all orders in the USA. To keep your shipping cost down we only add insurance upon request. Please contact us if you're interested in adding insurance to your order, or if you need your shipment rushed, and we will let you know how much it will add to your shipping costs and create a new listing to reflect the additional charges. If the listing does not display shipping to your country please email or convo me for a quote.